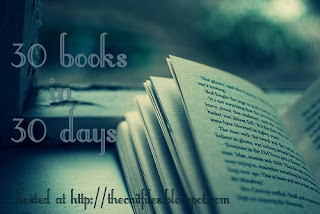 The thirty books in 30 days challenge is one hosted by Cait at The Cait Files. I am planning on participating in this challenge since I still have 30+ books I haven't gotten to from the RT Convention Day 1 & Day 2. I don't actually know if I'll be able to do this, but I'll try and would love to see you guys do it as well :)! That is crazy, you can really read 30 books in 30 days? I am starting to believe I really am a slow reader...I might check out the review hop. Thank for mentioning it!